Heterocyclic amines (HCAs) and polycyclic aromatic hydrocarbons (PAHs) are chemicals formed when muscle meat, including beef, pork, fish, or poultry, is cooked using high-temperature methods, such as pan frying or grilling directly over an open flame (3). The International Agency for Research on Cancer (IARC) also warns that deli meats can increase your risk of colorectal cancer (4). And so, it goes without saying that you should try to reduce your intake of meat and always select organic, free-range and appropriately fed meat. You can easily supplement your protein intake with beans, lentils, peas, nuts and seeds. You should definitely give Meatless Mondays a go! Cancer cells use more glucose (sugar) per unit of time than other cells (5, 6). Sugar metabolism creates acid, which also supports cancer progression. High sugar diets also put a heavy strain on your pancreas to produce insulin. Insulin resistance, which is caused by a high-sugar diet, has been directly tied to cancer proliferation (7). In addition, high fructose corn syrup contains carcinogenic mercury (8). It’s better for cancer patients to eliminate sugar in all its forms, even “natural” sugars like honey and agave, as well as white sugar and high fructose corn syrup. This also prevents magnesium deficiency, as the mineral is often depleted in the process of metabolizing excess sugars (9). Glutinous grains, like wheat, spelt and rye can cause inflammation. Especially wheat, which is full of pesticides, which are also pro-inflammatory. 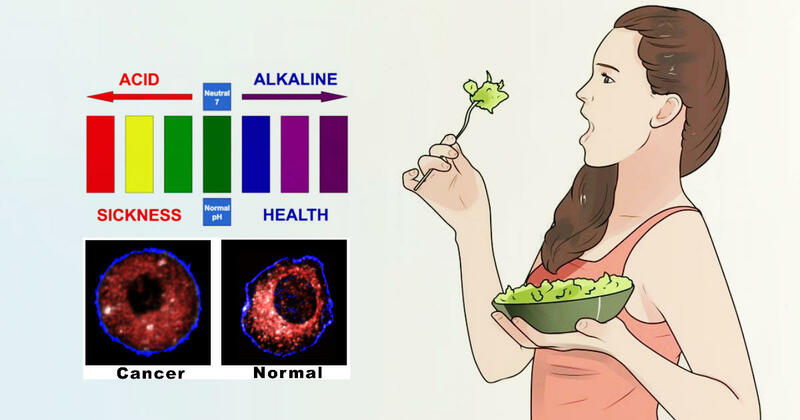 Pastas, cereals, bread, muffins, cakes, crackers, cookies and other baked goods should also be excluded from an alkaline, cancer-suppression diet. And while processed gluten-free foods may be more convenient, they often contain huge amounts of added sugars and unhealthy oils that cancel out their health benefits. Prof. T. Colin Campbell, PhD, Cornell University has stated that cow dairy is one of the most cancer promoting foods (10). Casein protein, which is often found in the powdered milk added to yogurt and cheese, causes inflammation, bone deterioration and feeds cancer in a way similar to sugar. Swap out milk for homemade almond milk or heart-healthy coconut milk and make your own cashew cheese. Ditch processed corn, soya, safflower and sunflower oils as well as hydrogenated oil and margarine. Fat is essential for neurons to communicate with each other. They act as a bridge by which an electrical impulse can travel within your nervous system. This kind of communication is essential for daily survival. Unfortunately, fats that are hydrogenated cannot preform this essential task. Instead, once absorbed by your cells they compromise the cell’s ability to function. These inefficient cells then act as broken sections of the bridge and create electrical dead spots in your body. Thus, important messages within your body are received late or not at all (11). This contribute to the development of cancer, a condition in which cells that no longer respond to intracellular messaging and proliferate without purpose, impacting other cells. Switch these oils for cold-pressed, organic and extra-virgin olive oil, coconut oil and avocado, which are naturally anti-inflammatory and help conduct proper electrical messaging within your nervous system. Coconut oil is particularly good for cancer patients with a suppressed immune system. Instead of reaching for a can of soda or a bottle of beer, try a tall glass of water. Store-bought juice should also be avoided, since it often contains high levels of refined sugar, food coloring and preservatives. If you want more diversity in your drinks, try making your own vegetable juice and green or herbal tea. If you really enjoy coffee, stick to a cup or less of this highly acidic drink or replace them with energizing detox shots. You can also make your own alkaline water here. You may find it hard at first to make the change, but it’ll become habit after a few weeks. If you’re someone who enjoys going out to eat, it’s best to stay away from most popular restaurant, as there can be a lot of temptation to revert back to your old diet. Instead, stick to organic vegan or vegetarian restaurants as they’ll likely have gluten and dairy-free food. These restaurants also know how to pile on the veggies and will respond better to your alkaline needs.